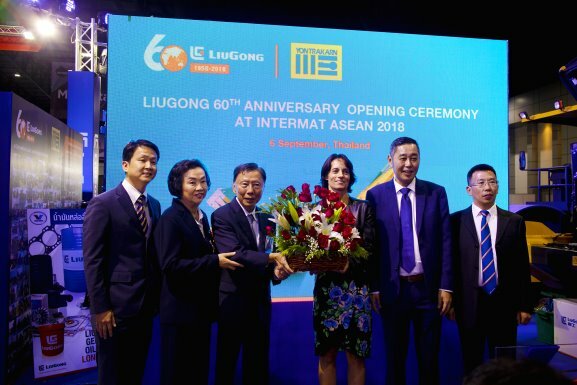 LiuGong celebrated its 60th Anniversary at the Intermat ASEAN exhibition on 6 September. During the celebration, LiuGong provided cakes, games, prizes, entertainment and special promotions for their customers and its booth visitors. The exhibition is taking place from September 6th to 8th, 2018 at Bangkok, Thailand and this celebration is a part of LiuGong’s 60th Anniversary Global Tour. Founded in 1958, the company has become an internationally renowned industry leader and the 25th largest construction equipment manufacturer in the world. “I am truly honored to be here representing LiuGong to celebrate our 60 years of excellence with our Thailand customers and partners.” said Mr. Robin Li, the Deputy General Manager of the Overseas Sales and Marketing Division of Guangxi LiuGong Machinery Co. Ltd. in his comments at the occasion. Mr. Robin Li flew to Bangkok to address to the Thai customers at the celebration ceremony. “Participating at the Intermat ASEAN also gives us the opportunity to showcase our rich history and also introduced our new series of construction equipment with new technology for Thailand” he added. In addition to its anniversary, LiuGong also celebrated another milestone which is being the top wheel loader provider in Thailand for seven consecutive years since it has entered Thailand market from year 2011. “We are truly happy with this remarkable achievement and are very thankful to our customers for their continued support. LiuGong will continue deepen its commitment in Thailand by working closely with our long- time partner and dealer Yontrakarn Machinery to widen our product range here and delivering full solutions to our clients” Mr. Robin Li added. The H-Series wheel loaders and E-Series excavators and rollers showcased at the event included a wheel loader 856H, an excavator 915E and a roller 6611E. “We are very proud to present our latest innovative technologies – the H series wheel loader and the E series excavator and roller that are specially built for the tough demands of construction equipment industry” said Mr. Robin Li. The new high performing equipment features new engines, more efficient systems and ergonomic improvements enhance the operator experience. They are more productive, responsive and easier to operate as a result. LiuGong Asia Pacific subsidiary who have been providing premium lubricant oils to their market launched their 7 litre pack during the event for the 60th anniversary celebration.